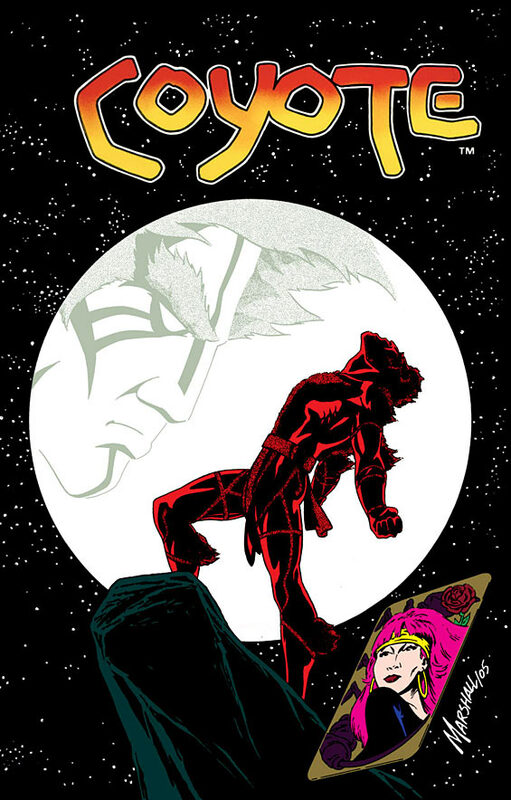 If you weren't reading comics in the 80s, you might not be familiar with Coyote. He's one of the transitional characters that appeared during that period: a superhero that doesn't appear to be such at first glance, originally published by a new company (Eclipse) instead of an old stalwart, and creator-owned. Coyote is a mystic with magical powers, enhanced senses, and an ability to dance through realities. Practically, that means he can become invisible, move through walls, and change his appearance. As a child, he was orphaned when his parents drove to the desert to watch a nuclear test. A wild were-coyote man found and raised him with the aid of a "psychic vampire" woman. But who is Coyote, you ask? Englehart gave us a synopsis of his origin. "Coyote's parents were living on a reservation in the Central Nevada desert and were moved off of it so the Government could conduct nuclear tests," explained Englehart. "But they didn't really get that, the tribal claim over the land was centuries old, so one day they took their little newborn and drove out to go see their old homestead. The parents walked up the hill, there was a bright light and the parents never came back. So, this baby was left dying of the heat in this abandoned pickup truck where he was found by the Coyote totem spirit himself who then raised him. That's why he spent his entire life living in the desert without seeing another human being, but growing up totally conversant with all the different totem spirits—the buffalo, the snake, the horse and all that—so he's a human being, but his world was completely mystical and unencumbered by anything that we call civilization. So, at the age of 18 when he walks into Vegas for the first time with the bright lights, buxom women, flashy cars and $2.99 steak dinners. "So, he's been living in the desert his entire life and this is the first human, western civilization reality that he sees and therefore he assumes the entire world is like Las Vegas and expects the entire world to be this giant playground. So, he comes in and sort of runs afoul of all the things happening in our world. He's not prepared for them, but on the other hand he can roll with the punches. He can take a joke and he can turn a joke around on other people who're trying to put it on him. So, he gets mixed up with the casino business, gangsters, etc. But, then as the series went on, I assumed that anything that didn't exist in the Central Nevada desert was fair game to throw at him. Over time I've got aliens, I've got the Israeli secret service, hit women who can kill you by looking at you, etc. I was sort of throwing in the super villains, the cosmic stuff, politics, just sort of everything because it's all weird and all fun to him. Again he's happy go lucky, so the weirder it gets, the more he likes it. It's him kind of figuring this whole thing out and coming to terms with how weird this all looks to him. Just by blundering around he gets involved in the middle of other peoples plots, gains enemies, lovers and friends." COYOTE started off well, although it eventually veered into incomprehensibility. I especially loved the artwork by Marshall Rogers. It was detailed yet uncluttered...told elaborate sequences crisply and cleanly. The first issues offer a primer on how to do rich, story-oriented comics. But when Englehart talks about Coyote's origin, something's off. 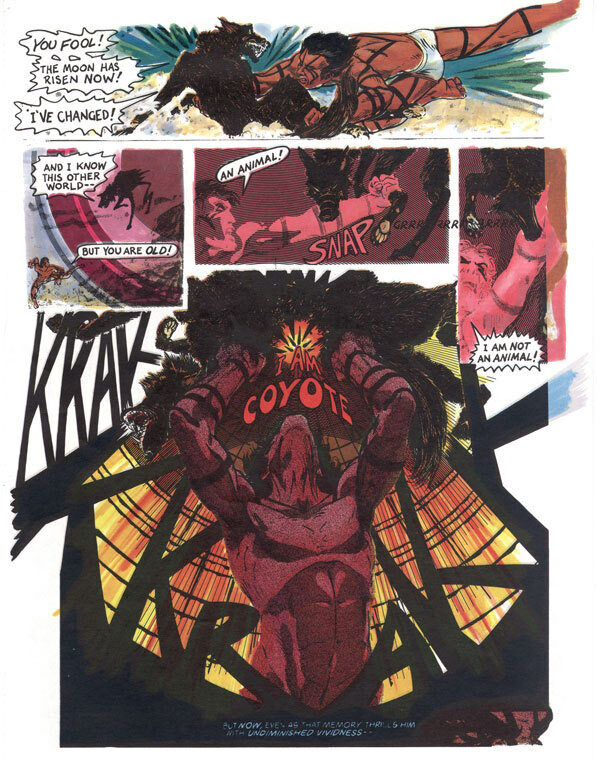 He claims Coyote has a Native background, but there's no evidence of it in the comics. Coyote is a Native-like trickster, but as I recall, there's no mention of an actual Indian connection. This is bolstered by Coyote's self-identification as Sly Santangelo, a Latin-style lothario. Englehart may have intended to give him a Native origin, or implied such an origin, but he didn't do it explicitly. Coyote could've been the premier Indian trickster in comics, but instead he's a pseudo-Indian trickster.